Horridon: The Zandalari brought powerful creatures with them to the Isle of the Thunder King to use as engines of war. Led by the War-God Jalak, the dinomancers of the Zandalari Beast Ward use ancient tribal magics to strengthen the great beasts and command obedience. The horns of Horridon, the fabled mount of Jalak himself, can tear through the stone walls of a keep as a blade cuts silk. Just today I said out loud, "I want to ride a Triceratops." So . Is this a loot from the new rare mobs ? Probably thats gonna be a boss drop. thats the mount of the new boss Horidon out of the 13 new ones in the new raid Throne of Thunder. "Horridon: The Zandalari brought powerful creatures with them to the Isle of the Thunder King to use as engines of war. Led by the War-God Jalak, the dinomancers of the Zandalari Beast Ward use ancient tribal magics to strengthen the great beasts and command obedience. The horns of Horridon, the fabled mount of Jalak himself, can tear through the stone walls of a keep as a blade cuts silk." Hunters get the ability to tame "Dire Horn" mobs, and now we get matching mounts. TRICERATOPS mounts. I F'ing NEED it. I want it. I have to have it. I will kill for it. I will steal for it. I will double-cross and ninja for it. I will deceive and blackmail for it. I will do whatever I need to, to get this mount. I sure hope this means we'll finally have a tamable Triceratops for Hunters. Dropped from Horridon tonight. Interested to see if it's 100% or a random drop chance. 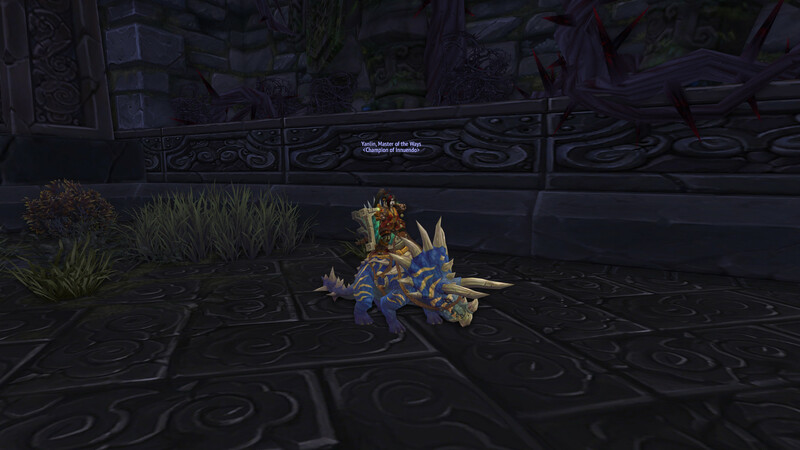 For once luck has been with me, and I managed to acquire this absolute beauty of a mount tonight! Managed to get one as well tonight. I usually never win on raidrolls, but this time I did. I've uploaded 4 screenshots that just needs confirmation. 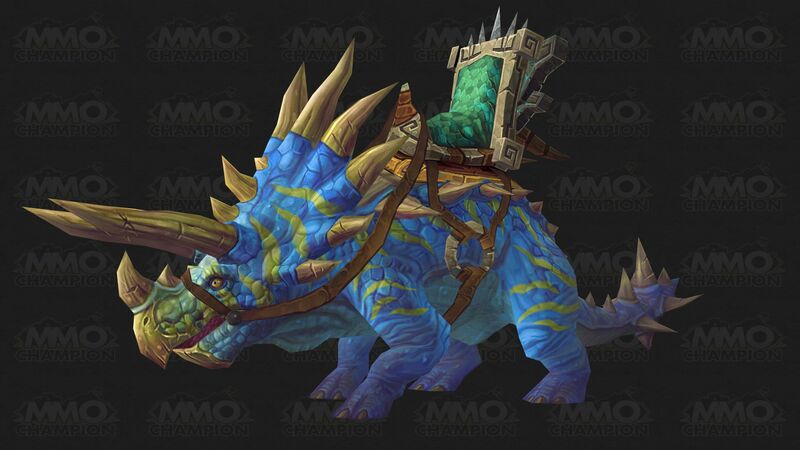 It's just a re-skin of the other direhorn mounts. The drop rate seems rather high, considering there's already 3 reports of it dropping after patch launch which was today (yesterday for the US). This mount has a small chance (1 % - 1.5%) to drop from the second boss in Throne of Thunder. It does only drop from normal and heroic difficulty, so expect it to be pretty rare. Spawn of Horridons model is a blue direhorn which can also be seen on Isle of Giants. I only made an account on here to say that it DOES indeed drop from LFR. Happened 5 minutes ago. Does this have a chance to drop from bonus rolls by chance? This is the wierdest bug. A few days ago, I went into LFR and got this and went to myself, "what is going on? This doesn't drop in LFR!" I learner it and rode around on and had fun. The next day when I came on, it was gone, but I had a son of galleon in my mount journal! I thought I was going crazy, but it was right there in front of me! Today I came on and had some invisible mount with no discription or anything! I logged off and came back on, and the bugged mounts were gone. If you know anything about this bug and what happened to me, please reply because I would love to know what happened. This mount can drop from extra roll. Got it drop yesterday after yet another 3-man kill I did. 2 guys passed and I won, yay! 235th mount. I have to say though that it looks quite similar to all other dino's, just a recolour which is quite a shame I must say. So how am I suppose to kill an Elite by myself to get this mount? Ah crap this is a mount from a raid drop. (Note that the video was made post-item squish, but prior to the global health nerf to mobs. Thus, while Horridon has 12M health in the video, he only has 8.3M health now, making him substantially easier, especially with good tank gear). This is very easy at level 100. Interrupt dinomancers, and prioritize adds. You should have no problems with the enrage, and the most dangerous parts of the fight (third/fourth doors, Triple Puncture at the end) are not much of a threat with the much larger health pools. I would recommend 610+ gear, as your haste/multistrike/Death Strike healing are very low otherwise. For a slightly more detailed explanation on how to execute this fight, see the following. If you are doing this at level 90, you should have 570+ ilevel. It may be possible to pull it off with slightly less considering the 33% health nerf, but you might run into difficulties with the enrage, and it's already a challenging fight! Take Plague Leech, Asphyxiate, Lichborne, Runic Corruption/Blood Tap, Death Pact, and Remorseless Winter. 1) During the first two doors, you should decide whether or not you want to kill adds. This will depend on your gear level - with less gear, you will have to focus on Horridon more in order to beat the enrage - which comes at the cost of complicating survival. With more gear (or at level 100) you'll have minutes on the enrage, so you should focus down the adds in order to have an easier time outhealing the damage. Dinomancers will demand your immediate attention, regardless of whichever tactic you are using. You must prevent them from healing Horridon at all costs. Kill them as soon as they spawn. 2) During the third door, you must avoid disease stacks, as these will kill you very quickly. Use your Army of the Dead to tank the adds that spawn, as they hit hard. 3) The fourth door and the last phase are similar - it's a battle for survival. Use your consumables (Drums of Rage, Draenic Strength Potion, Draenic Armor Potion, even better) to kill War-God Jalak right away. You'll also have to watch out for Triple Puncture, as you'll have 30 or more stacks by this point. You can NOT get this with a bonus roll. We really need this to be a flying mount, given the description. Kor'kron Juggernaut is dropped on mythic mode only by Garrosh Hellscream, the 14th and final boss of Siege of Orgrimmar. It is currently listed in Wowhead's simulated "tooltip" as a 7.08% drop rate, but it's unclear how that figure was derived or which looting method(s) it refers to, since it can be obtained using traditional looting methods like Group Loot and Master Looter, as well as the newer Personal Loot. It's possible the 7.08% figure is inflated from inclusion of data during the Mysts of Pandaria expansion, when it was a guaranteed drop. None of these mounts can drop in LFR. Note that you cannot bonus roll any mounts from any instanced raid bosses. Bonus rolls do work for mounts from Pandaria's four world bosses, Sha of Anger, Galleon, Nalak, and Oondasta, though not for Draenor's world boss Rukhmar. You can loot mounts whether or not you can currently use/learn them; for example, you can obtain the reins to a cloud serpent mount before you become exalted with Order of the Cloud Serpent. Percentages above reflect drop rates from actual data, and will differ from the probabilities Blizzard has set, especially with smaller sample sizes where "good" or "bad" luck skew the data more. Dropped for me today (4/22/16) on 10 man Normal Horridon, after 402 kills, spread across 25 toons. Keep the faith - the mount still exists! I got this mount today (3rd August 2016) after a total of 34 runs. It dropped on 10 Normal. I'm so happy! Got this mount first try, throne of thunder is easily solo'able now. played balance druid for the trash mobs and bosses and switched to guardian when the fights were a bit tougher. Footage of the mount dropping with live reaction. I am sooo pumped! This mount dropped for me today on my 2nd run. I did 1 run of 25 man H last week and today I decide to run it on 10 man H and bam it dropped. I don't feed into RNG paranoia but I really think doing ToT on heroic will get you the mounts quicker. Just looted this mount 2017-12-19.
as of today i have 189 tries but no mount, dont give up on that beast..good luck to you guys and merry christmas! i guess i was too lucky just started to clear ToT on a single character like 2 months ago got it on 8th kill wasnt even expecting it to drop. Just got this today. This was my 2nd run of all time in this place. Got it on 25 Heroic. I'm not sure if I just got really lucky or they increased the drop rate. Good looking mount, kind of small on an orc though. Finally got mine to drop in Normal 10m, after 85 Total Kills. Don't give up! Got it on my 39th attempt! YES! check my raids if you want :D ! The "Dropped by" Tab says this mount only drops in Normal 25 mode. I can confirm that this is false. I just had this mount drop in Heroic 10 man mode. Fits really well with the Horde starting zone Zuldazar in BfA. Dropped on my 307th. Don't give up, sometimes you think it can't drop, just keep on trying! This just dropped for me today, my rarity addon says after 9 attempts. Sounds about right, I never liked ToT that much back in the day, I just came in (at 120) to try and finish the raid achievements (for the skyscreamer). "When you see a hurricane coming, you get out of the way. Horridon would fight the hurricane and win."